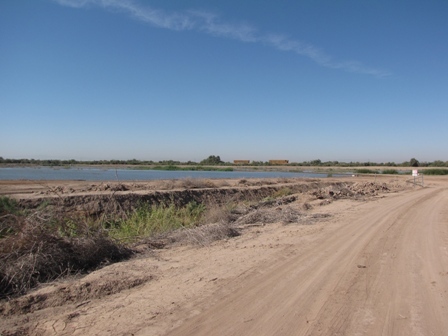 Visited the Alamo River Wetlands Shank Road site on Saturday Oct 20. 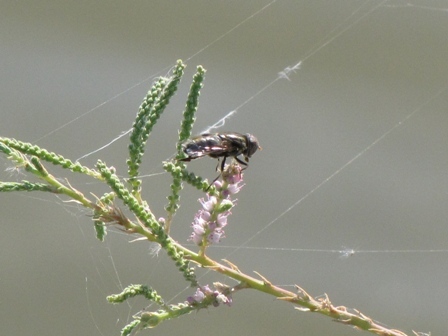 There were lots of little treasures to be discovered with good numbers of birds and dragonflies and such. 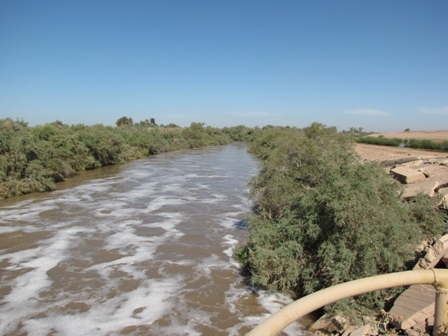 The list of birds and odonates seen is at the bottom. The “Saltcedar Pull” will be next weekend on Saturday October 27 from 8:00am till 10:00am if you would care to come out and see what treasures you may discover! Directions and more information about the event may be seen at this link. So here are pics of some of the treasures I found. Click on the thumbnails for larger images! The main purpose of the wetlands is to help clean up water by flowing it through settling ponds and natural vegetation. 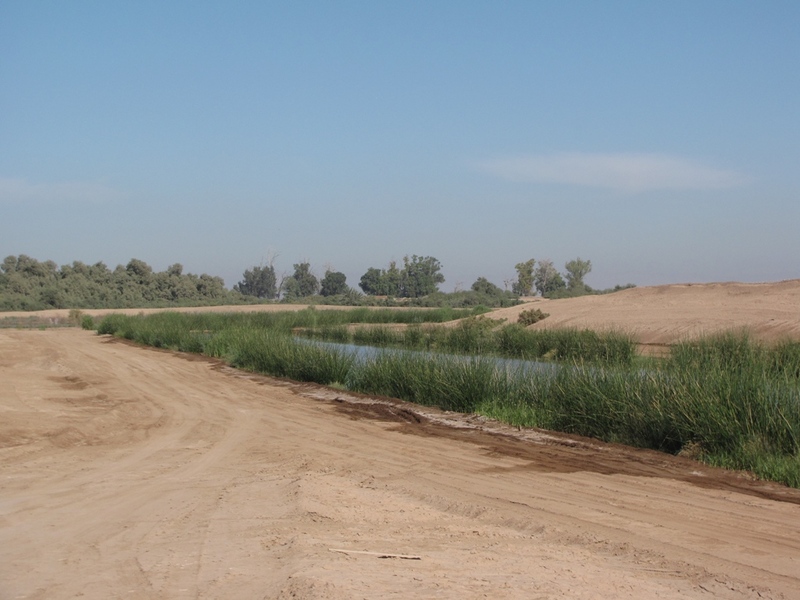 Eventualy there will be many more of these sites along the Alamo and New Rivers that flow into the Salton Sea. These smaller sites tipically catch water before it enters the river but this one does take in some water from the Alamo River and the larger ones in the future will cleanse even large amounts. 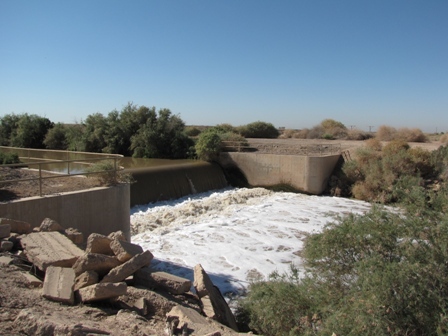 This is a “drop” on the Alamo River near the head of the wetlands. 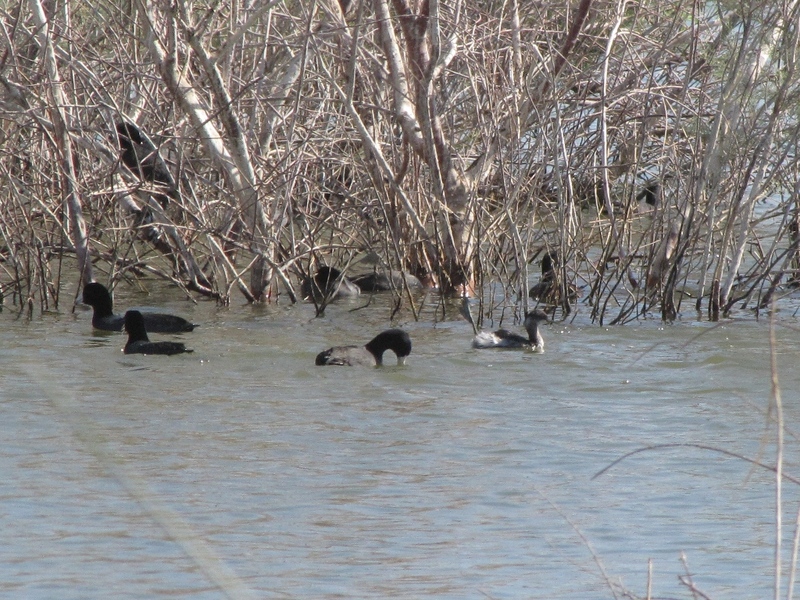 There were about 400 American Coot on the ponds but there were also another 21 species af birds on or above the ponds too! Do not know what species this fly is. It moves and hovers like a bee and is quite colorful. 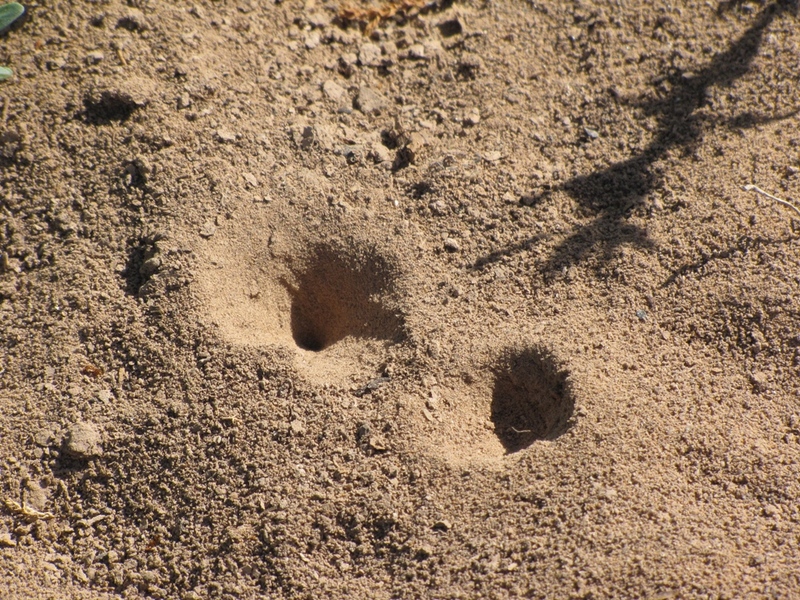 Ant Lions had their little burrows in the soft dirt. 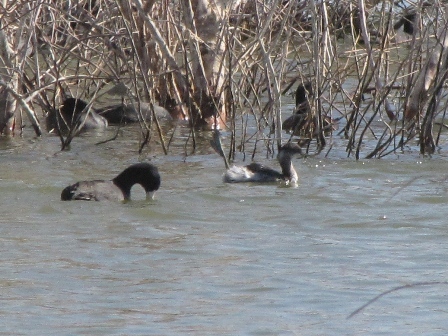 When they are in this stage they look like miniature creatures from the movie “Tremors”. You may have seen the adults at night around your porch light and not known it. 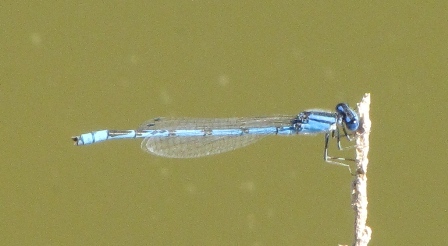 The adult looks like a small brown damslefly except that they have antennae and damselflies do not as you will see in the following pictures. Next time you see one of these little burrows, take a fine blade of grass and lightly tickle the bottom of the burrow and watch what happens! 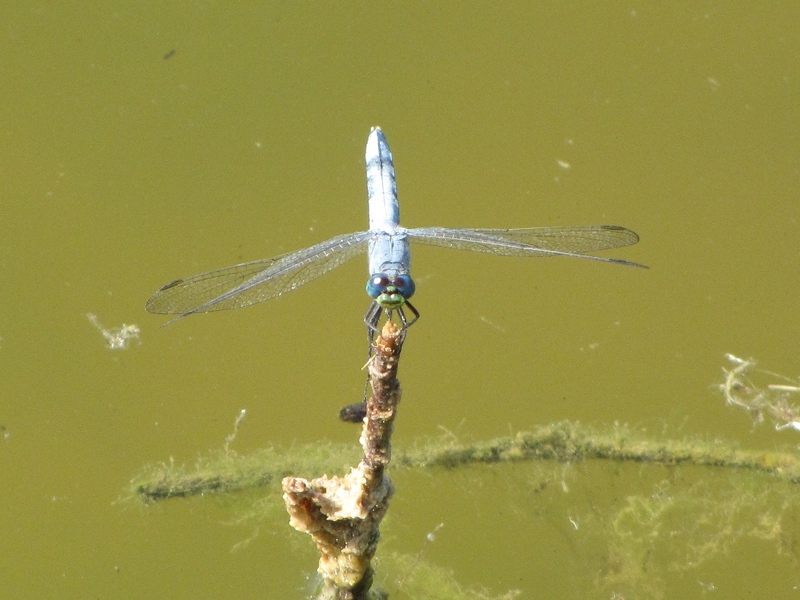 Damselflies and dragonflies are in the Odonate family so folks who like to look for them are affectionately known as “Oders” and they are chasing damsels and dragons……:-) Here are a few of the damsel and dragon treasures I was able to see at the wetlands. Damselfies hold their wings together on our just above their back and are small with seperated eyes. Rambur’s Forktail have two small dots on top of their eyes and are relative newcomers to our area. 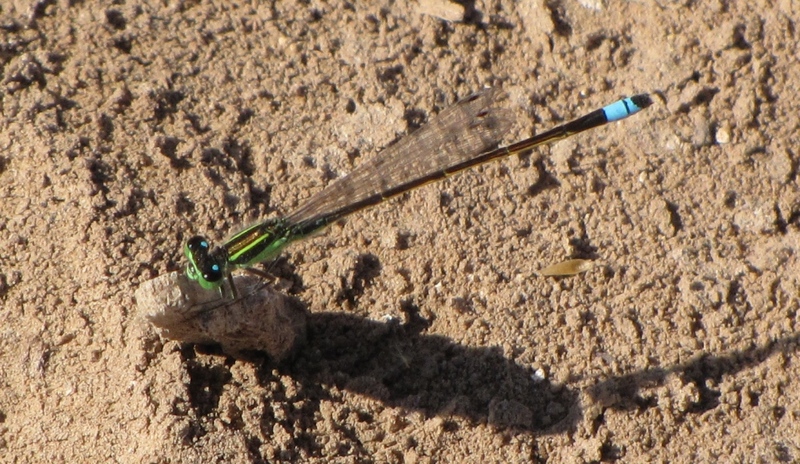 Desert Forktail have been here much longer and look similar except that the dots on their eyes are joind like two teardrops touching. 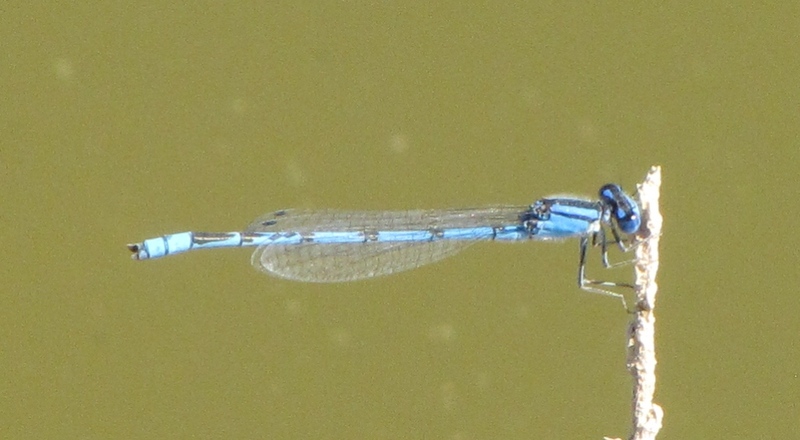 Familiar Bluet are probably the most common damselfly you will find in the valley and there sometimes appears to be swarms of them on the water. 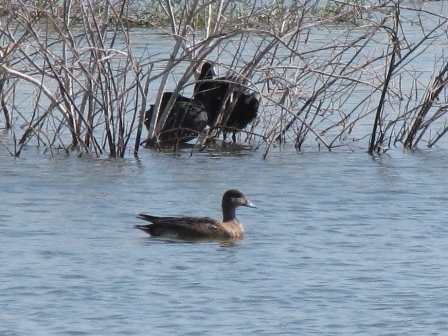 The first is a male and the second a female in flight. 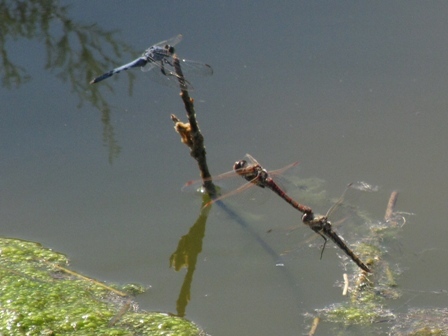 Here are a few of the dragonflies seen. 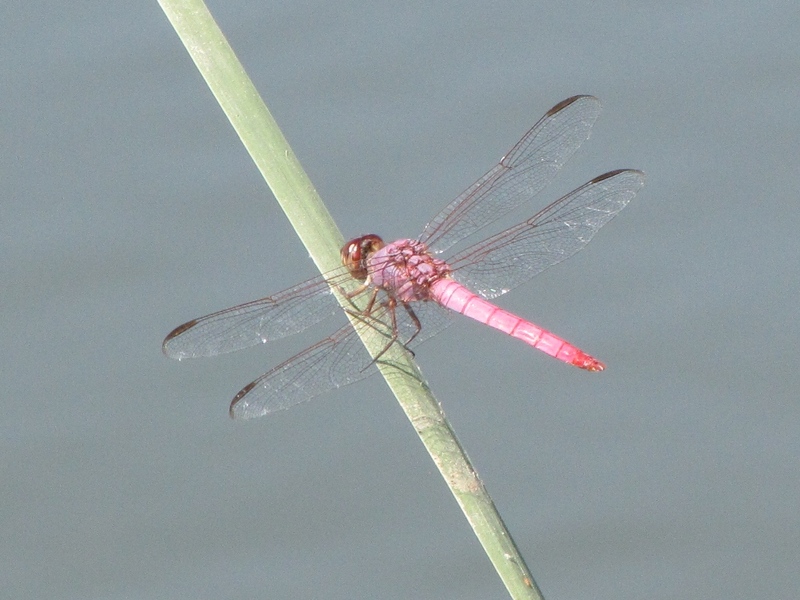 Dragonflies are larger, hold their wings out to their sides and their eyes are typicaly joined at the top. The first here is a male Western Pondhawk and it prefers being close to the surface of slow moving water on ponds. It looks very similar to Blue Dasher except Blue Dasher have white on their face and Western Pondhawk have green faces as you can see. 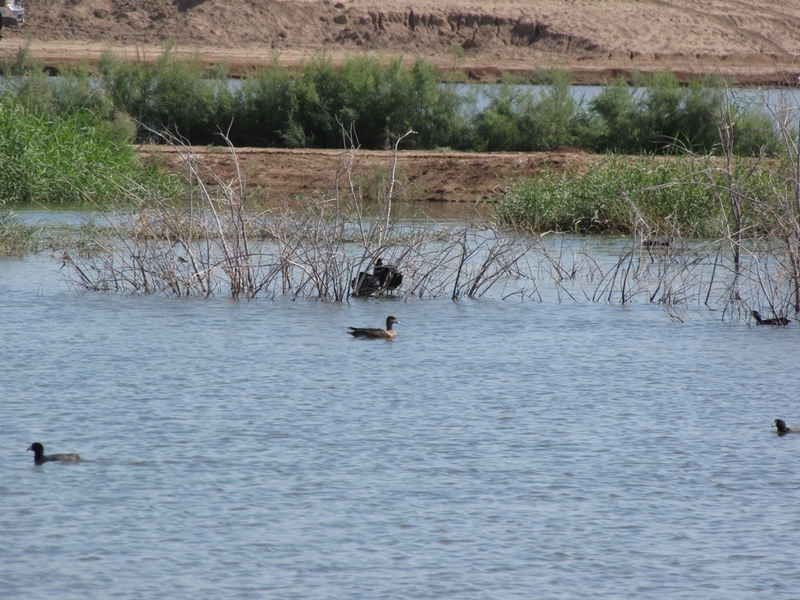 Blue Dasher prefer higher perches so can be found more commonly all across the valley along the canals and such. 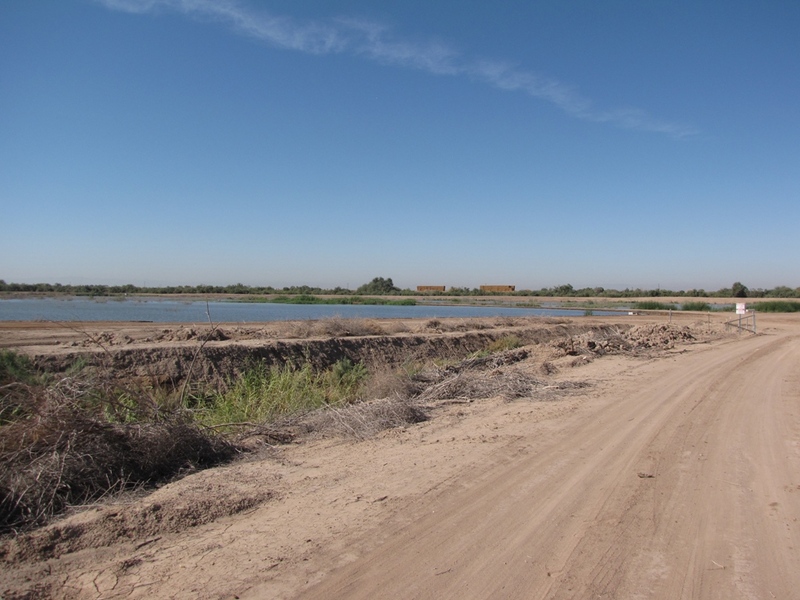 October 29 is the latest date that Western Pondhawk have been recorded in California so I will be checking back on these few!! 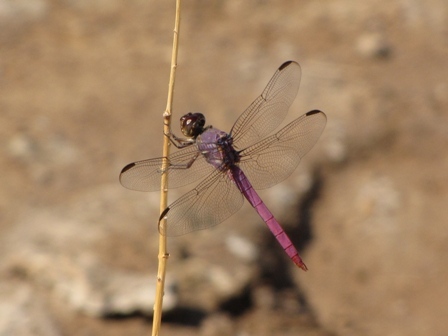 The next two pictures are of male Roseate Skimmer and you can see why they are one of the most sought after dragonfly species in our desert southwest! This next one is of a male and female Variegated Meadowhawk ovipositing. 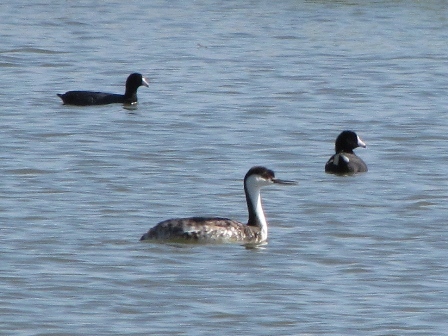 They fly in tandem and dip down to the water where the female slaps her eggs into the moss. 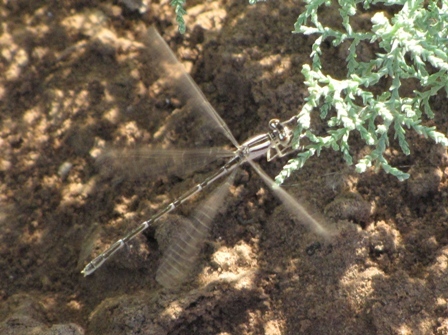 They are the one dragonfly that can be on the wing all year long here in the valley and the most common one you will see. 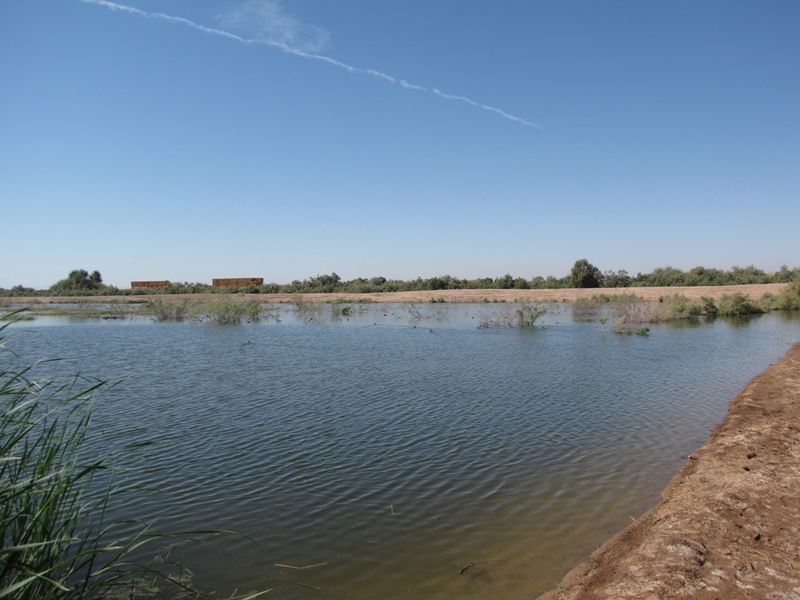 There is also a Western Pondhawk in the scene. 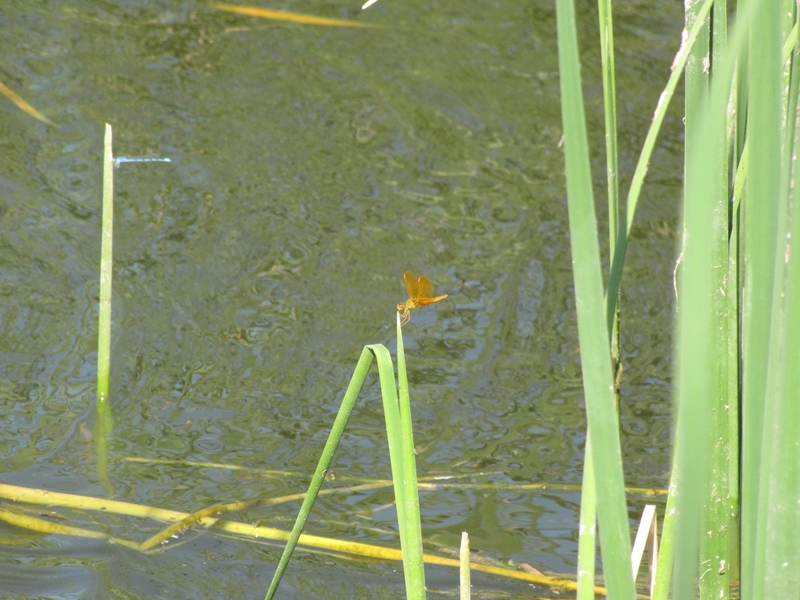 The colorful dragon below is a male Mexican Amberwing and they are the smallest dragonflies in North America! 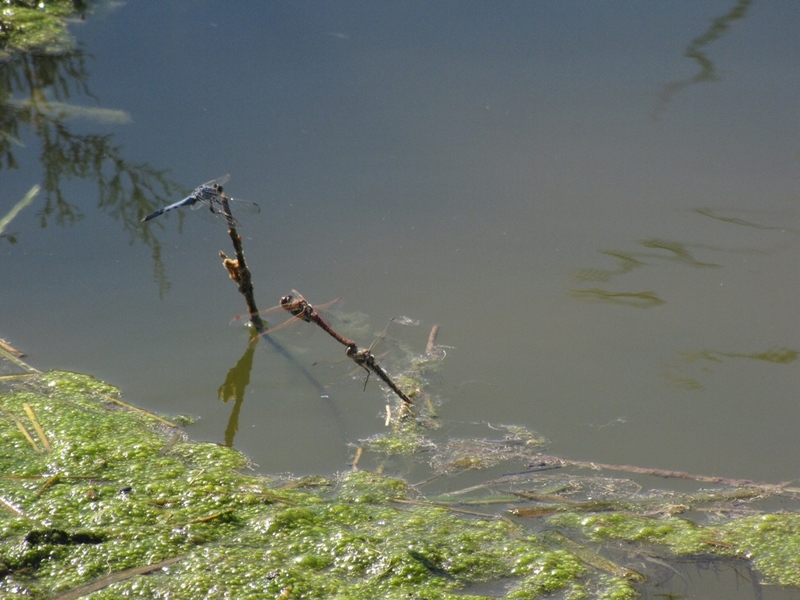 Click on the thumbnail and in the larger image there is also a Familiar Bluet damselfly so that you can see just how small they are. 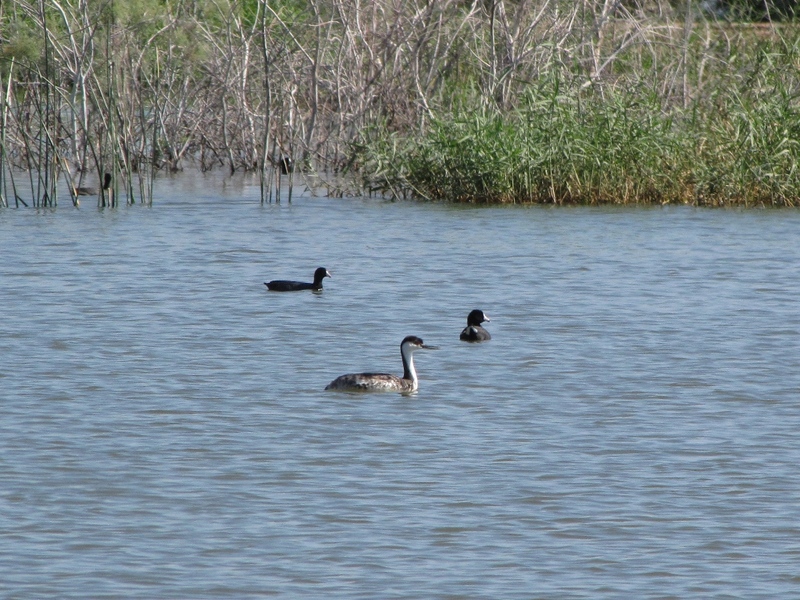 Those are the treasures I turned up at the wetlands in just a little over an hour. 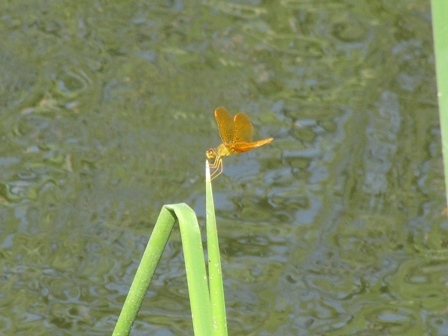 As the weather cools off there will be many more bird species and much fewer dragons and damsels on the ponds. If you would like to see a real special treat, be out at the wetlands just before sunset as there are MASS quantities of Cattle Egrets and White-faced Ibis roosting at the ponds at night and the evening fly-in can be pretty spectacular!! Comments: Submitted from BirdLog for Android v1.6 About 90 degrees light breeze. Dragonflies seen were Roseate Skimmer, Mexican Amberwings, Variegated Meadowhawk, Black Saddlebags, Western Pondhawk, Blue-eyed Darner, Familiar Bluet, Rambur’s Forktail.